I was ten years old when I started writing (if you want to call it that; there were a lot of run on sentences and a good amount of plagiarism involved back then; I like to think I’ve moved on from the plagiarism part). But, it wasn’t until I was around 20 that I actually finished something. It was a really bad short story for a college writing class about a supernatural painter that captured his subjects’ souls in his art. Very Twilight Zone, though not like one of the cool Richard Matheson ones. But even so, it was a big deal, actually finishing something. I had started (and failed to finish) dozens of stories before that. I would start them, hit some kind of wall, get disillusioned, then get pulled into writing something new, where the pattern would repeat all over. It wasn’t until I finally had the responsibility of a deadline for a class that I actually pushed through and got it done. So what was the problem? And why is it important as a writer to finish anything? First, what do we actually mean when we say “finish” something. In this case, it doesn’t just mean to stop working on something…it means to have a completed story, from beginning to resolution, opening sentence to final line…no matter what. And by “no matter what” we mean no matter how crappy or inane or ill formed it is (and if it’s a first draft, it probably will be all of those things). For young writers (myself included at the time) the pattern goes pretty much like how I described above, the cyclical starting and abandoning of projects. But why? It’s because when you start something new(script, novel, comic book) it’s all exciting and energizing. It self motivates. Words come easy, because you’re writing all the scenes and moments you’ve been seeing in your head for however long. The moments probably aren’t connected to each other or cohesive yet, but you know they will be eventually, so you plunge ahead. This is the inevitable moment when writing ceases to be the joyous fountain of creativity you may expect and instead…becomes work. And work, isn’t something most people want to do. 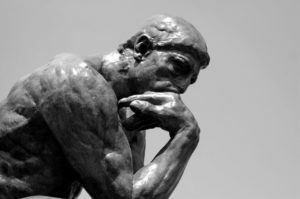 When I’m asked what writing is really like, I tell people, “Actually, it’s a lot of this…” and then mime the Thinker statue, with my fist under my chin. Because it is like that. More than most books on the craft of writing that we read will tell you. Fifty percent of my time writing is spent figuring stuff out. Why does the transition between these plot points feel weird. Why does this dialogue make me cringe? Why is my heroine walking right into the clearly very dangerous haunted house? When writers hit this point…the allure can wear off quick. What was coming so easily before now has become tedious. The words that were flowing previously have stifled, because…well, now you have to figure out what they are and why they are. Its not in your head anymore. The truth is, this is how writing is for most writers. There are exceptions, authors who just sit down, crack their knuckles, and the words gush out of them like someone had turned a spicket. But those are the minority, I promise. At least ones producing stuff you’d want to read. Even the most prolific writers out there, at the end of the day, have to punch the time card, sit down and just…think. And work through problems. And find solutions that turn out to pose even more problems that then have to be answered. Over and over again. Until they have a finished narrative, which may or may not be any good. That is why finishing something is a milestone. Finishing something with true forethought and intention is a victory. Doing so, puts you at a different stage of your career and progress as an artist. No matter how bad that draft is, it is a triumph, because you had to sit and think and work to make it a reality, piece by piece. You constructed something. Making it a goal to finish your project will pay great dividends for you in the future, because, like most things in life, the first time is the most difficult time. As important as this reason is for completing a project, though, in my opinion there’s actually an entirely different reason…and it might be even more important. I’ll talk about that in another post. In the meantime, if you’re a writer (or another type of artist) what was the first thing you truly finished? And did finishing things get easier after that? If you actually made it through this entire post, maybe you’d like to read something that’s actually entertaining of mine (we can all hope, at least). My new novel The Razor launches November 27th, from Tor. Sign up for my mailing list, and I’ll give you a free copy of the first chapter.